5793 labyrinths found. Showing 2301-2320. Sorted by country, state, city, then zip/postal code. Behind Building on right. You can park in building lot and then walk behind the building. It is next to but above the Natchaug River. CliCk is a nonprofit 501c3 that helps incubate culinary businesses and teaches classes on gardening, nutrition and culinary arts. In the back yard of the classic New England white steepled church at the south end of the Common on Woodstock Hill, across from the Pink House and Woodstock Academy. 11-circuit classical on sand and grass, with 2' paths and stone walls. 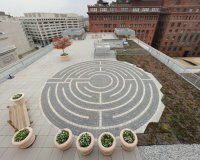 Located near Union Station on the red line via metro, this is a permanent installation including a green roof and labyrinth, perhaps the only one of its kind. It is located on the rooftop terrace of a commercial office building near the intersection of First and G Sts. Monday through Friday - 7 a.m. to 7 p.m. Please check in with the tenant assistant in the lobby of the building for information and access. Monday - Friday: 10am - 3pm - except Tuesdays, from 12:00-1:00, when we have a free concert. Labyrinth is located between K Street and the waterfront of the Potomac River in the new Georgetown Waterfront Park. 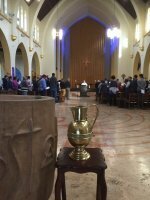 Whenever church is open, which is often - church is used regularly by nonprofit groups housed in the building and for community events. Cathedral Labyrinth Walks are held the last Tuesday of every month from 6:30 - 8:30 pm. Labyrinths with live music are available in the nave and a silent labyrinth is set up in St. Joseph's Chapel in the crypt. 38.937744 ° Lat. ; -77.087408° Long. Labyrinth with Buddha, Waterfall as seen from Rooftop. At the end of June Lane which is off Forrest Ave, across from Hardee's. St.Peter's Church also has a portable canvas labyrinth available for special events. 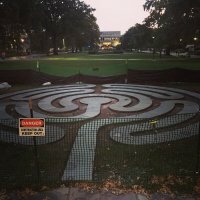 The Labyrinth is open daily from dawn to dusk, and free will donations to support the gardens and Labyrinth's upkeep are graciously accepted. The reason for calling ahead is to let my neighbors know who is on our property and for directions. The Classical left hand seven circuit Labrinth is in our yard . The path is 20 inches wide, lined in brick which is inset in the grass under a large pine tree. Where the cross meets at the center is a gazing globe and flowers. The Labyrinth was established in 2003. 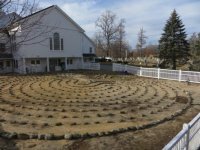 The Labyrinth of Millsboro and Meditation Gardens are located next to the church on State Steet, 2 blocks west of Main Street(Rt.24), in the downtown area. Candlelight walks on Thursday evenings. Surrounded by the four sacred gardens, each representing the white, yellow, red & black of the Native-American medicine wheel. Slate to be laid at a later date. Call for availability and check the UUFN website for details. Schedule for 2015: March 22 at 7pm, June 14 at 11:45am, Sept.23 at 7pm, Nov.1 at 11:45am. Also open on New Year's Eve 8-10pm. If your group would like to walk at a different special time during the year, contact the UUFN Office. Available for rental on request. The Helen F. Graham Cancer Center is located at Christiana Hospital. 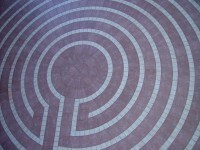 The labyrinth is located to the rear of the cancer center.